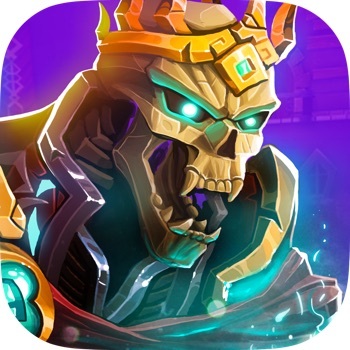 Dungeon Legends - Quest Hunter van Digital Things is een app voor iPhone, iPad en iPod touch met iOS versie 7.0 of hoger, geschikt bevonden voor gebruikers met leeftijden vanaf 12 jaar. Help your people! 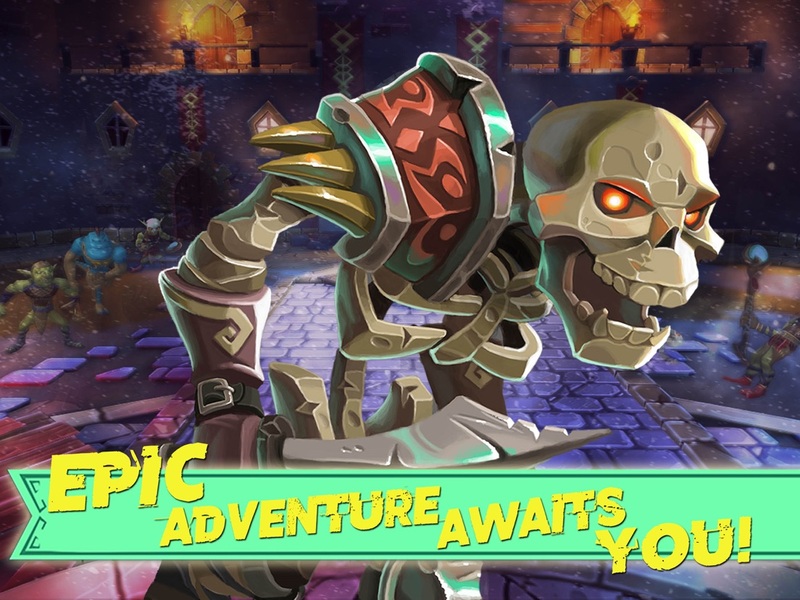 Join the fight against the Skeleton King, and become a hero in the dungeons. Live a real adventure with the best online Action RPG game. 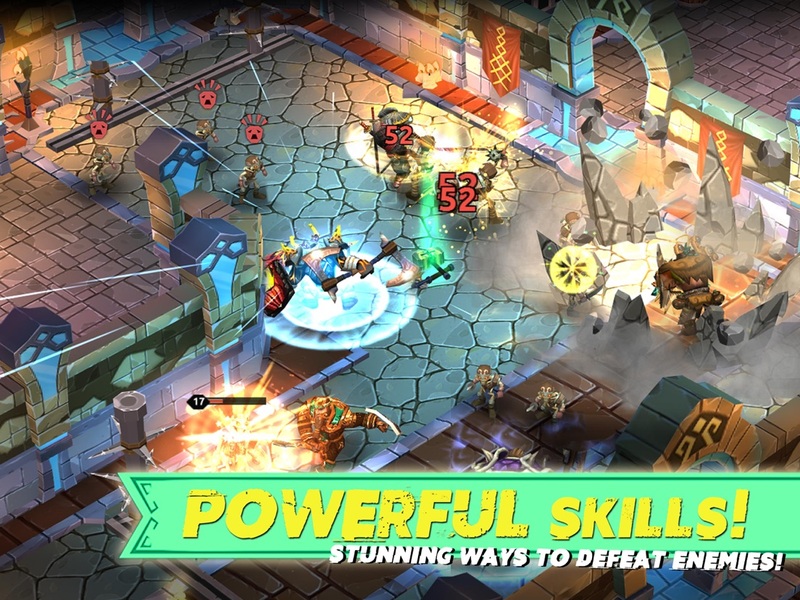 Enjoy Dungeon Legends for free, and discover an endless world of challenges. Fight against other players in REAL-TIME in the Arena, and become a legend of the dungeons. Go over the dungeons looking for incredible TREASURES, or ask for help to overcome the challenges of the online CO-OPERATIVE MODE. 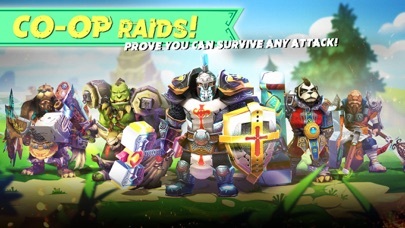 Join a CLAN and fight to conquer the dungeons. Trains your skills and adapt your character to your gameplay. 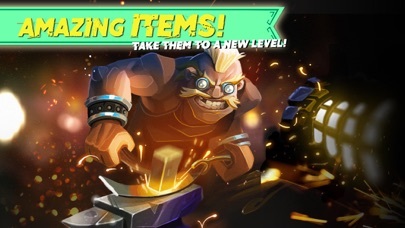 Turn your Dwarf into a WARRIOR, HEALER, or PROTECTOR by choosing the skills, and the items you wear before each game. As a Dwarf, there comes a time when you have to leave your town in search of gold and glory. It is an old tradition established centuries ago, when the Skeleton King appeared and attacked them. It was a long time ago, but Dwarfs remember. He attacked the villages with his army of goblins, skeletons, trolls, and balrogs. But Dwarfs do not surrender, they fear nothing, and they cooperated to take that army down. Dwarfs defeated the Skeleton King, and force him to hide in the old Dungeons, where dwarfs’ ancestors used to live. The Skeleton King is back. He is summoning an army to leave his prison, and take revenge on the Dwarfs. However, the Dwarfs will not be expecting him on their villages. 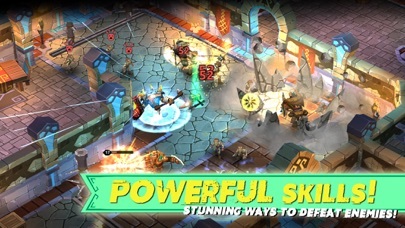 The Dwarfs nation is always willing to take action, and they want to take on the challenges of the dungeons to defeat the evil army even before the Skeleton King is ready to attack them. The Skeleton King is waiting in his throne, deep in the Dungeons, becoming more and more powerful with every creature he summons. The only hope for the Dwarfs is to find him, work together, and finish him before he recovers his power. Each trip to the dungeons is unique, and you can obtain new rewards to improve your skills. Enter the dungeons or take part on the weekly events. 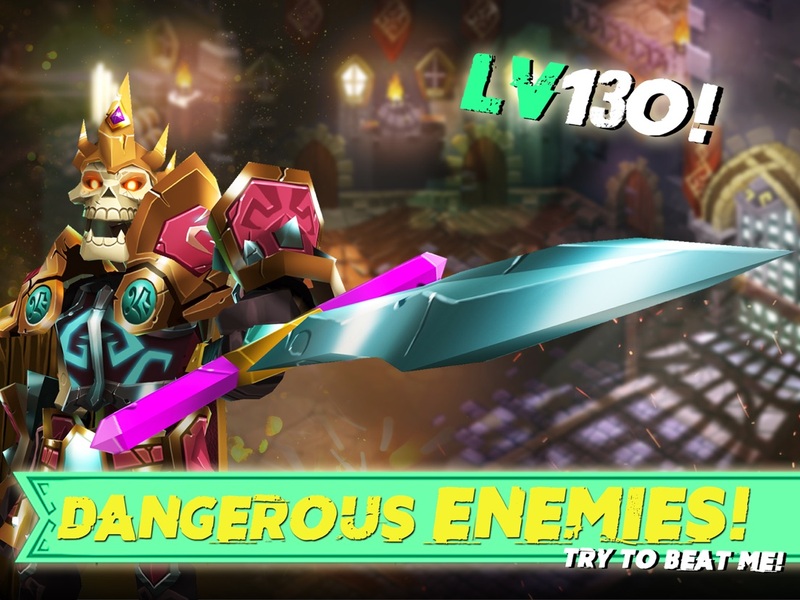 Fight against other players in real-time battles where your skills will make the difference. Enter the arena alone or with friends, and prove you are the greatest warrior. Unlock the power of powerful creatures, and use them to defeat your enemies. Pets improves your stats, and gives your dwarf a unique passive skill. Help your fellows dwarves in the PvE events, and compete with them in the PvP challenges. Each week there is a new opportunity to prove yourself as the best dwarf. The controls are designed for touch devices. 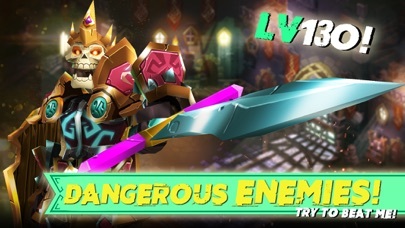 Guide your character through the passageways and find the right strategy to defeat the hordes of enemies, using a combination of your special abilities to vanquish them. 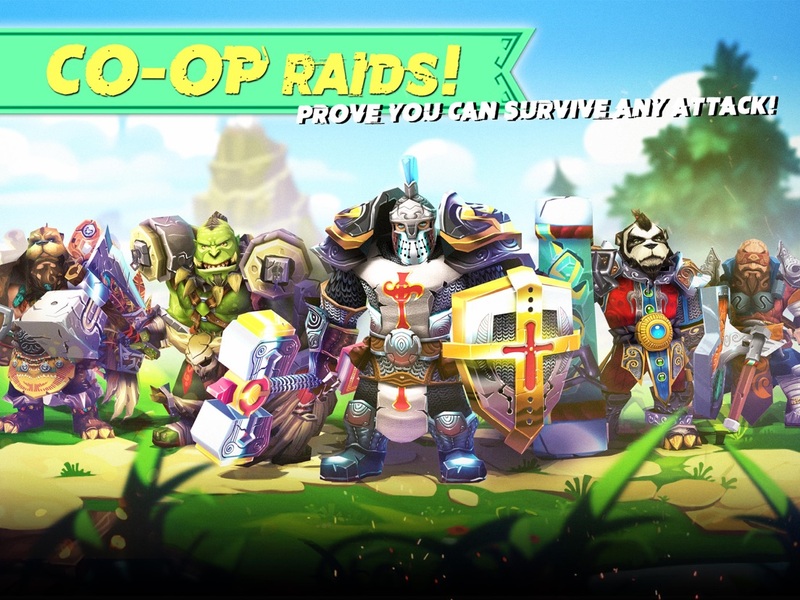 Explore the online co-op mode with your friends. 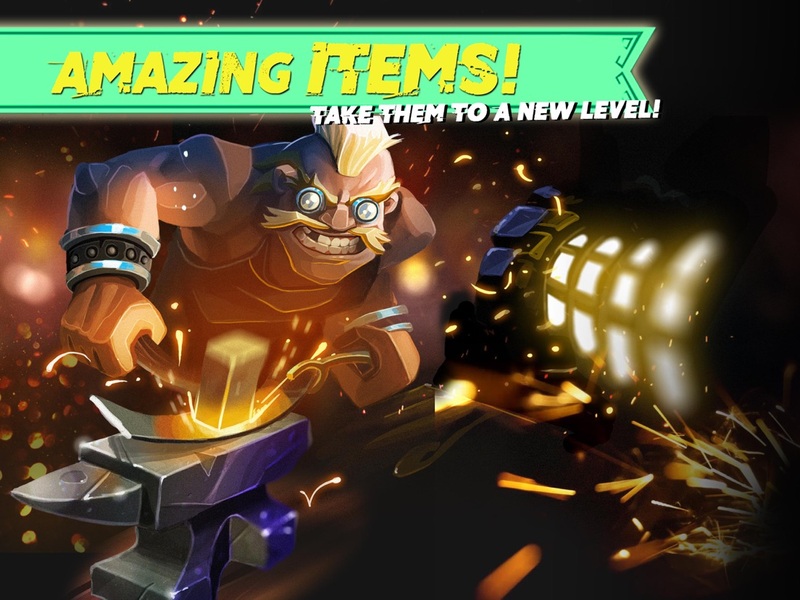 Team up with them to complete the hardest challenges and obtain powerful items. 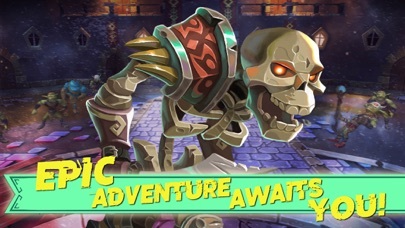 Informatie voor Dungeon Legends - Quest Hunter is het laatst vergeleken op 19 apr. om 11:03. Downloads verlopen via iTunes, bekijk daar altijd de meest actuele prijs, compatibiliteit en andere informatie. Je hebt een actieve iTunes account nodig om apps aan te schaffen. Content met intens animatiegeweld of fictief geweld kan regelmatig voorkomen. Fixed an issue that was giving problems to play in the clan feud. Royal Revolt 2: Tower BattleGratis! Idle Supermarket Tycoon－WinkelUniverseel · Gratis! Idle Airport Tycoon - PlanesUniverseel · Gratis! Super Idle Cats - Clicker FarmUniverseel · Gratis! Williaminepe reageerde op de Pineapple Pen Review met "Find yourself a girl for the night in your city:..."
Els Vervoort zei over Kryss - De Strijd der Woorden: "Ik heb het spel Kryss getest en VOND het leuk behalve de..."
Johan De Leeuw zei over BeWalking - stappenteller, stappen tracker: "Ik kan de app na 5 maanden dagelijks gebruik niet meer openen..."
Lieke zei over BooniePlanet: "Speel"
Philipsmame reageerde op de Pineapple Pen Review met "Find yourself a girl for the night in your city:..."
Huisman Gerrit zei over iDMSS Plus: "Na de laatste update april 2019 werkt de app pro niet meer de..."
Logo's, merk- en productnamen Apple, iPhone, iPad, iPod Touch en iTunes zijn eigendom van Apple, Inc.
Deze site is niet gesponsord, goedgekeurd of onderdeel van Apple, Inc.
Screenshots en app iconen zijn eigendom van respectieve uitgevers. AppWereld maakt gebruik van cookies, door verder gebruik te maken van de site gaat u daar mee akkoord.